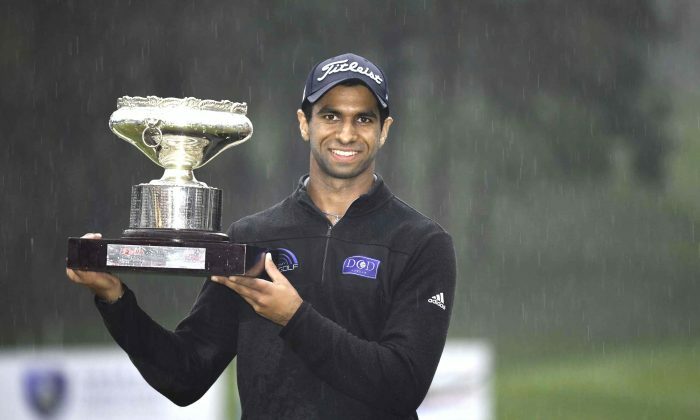 Aaron Rai of England displays the Hong Kong Open trophy after winning a wire-to-wire victory, his first European Tour win, just holding off Matthew Fitzpatrick also of England by a single stroke at Fanling Golf Club on Sunday Nov 25. (Bill Cox). 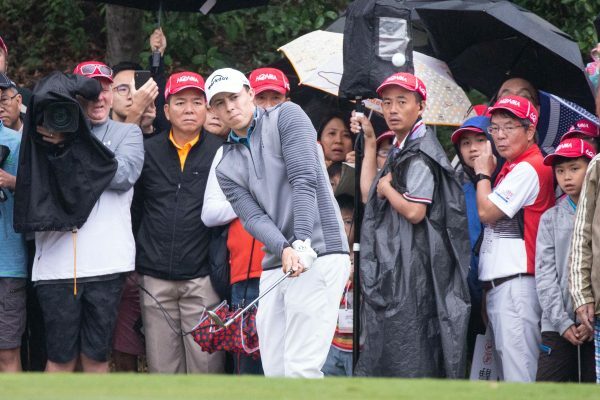 HONG KONG—England’s Aaron Rai overcame unseasonal damp conditions on Sunday to hold off a furious challenge from compatriot Matthew Fitzpatrick and complete an unnerved wire-to-wire victory at the US$2 million Honma Hong Kong Open. 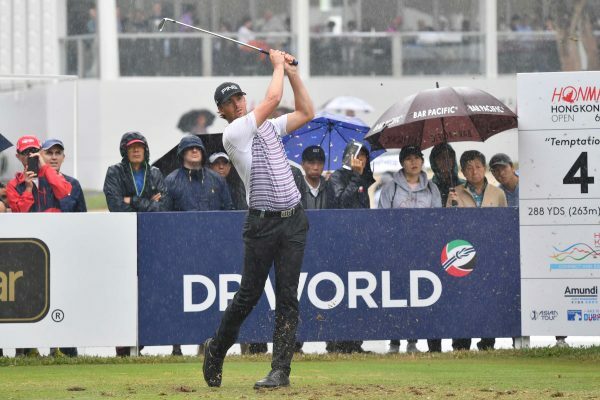 The 23-year-old from Wolverhampton felt right at home in the persistent rain as he shot a one-under-par 69 in the final round for a one-stroke victory over Fitzpatrick at the Hong Kong Golf Club in Fanling for his maiden European Tour title. 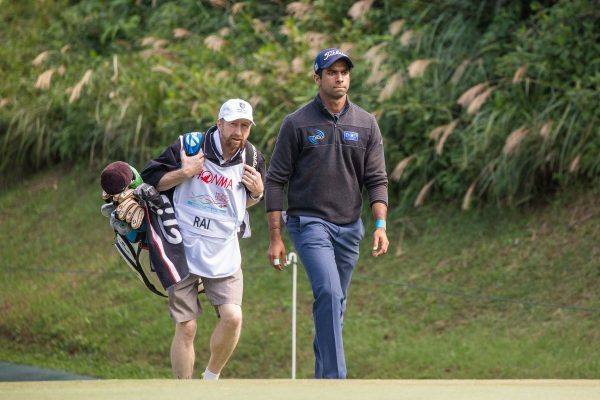 Although holding an impressive six-shot lead after 54 holes, Rai had to defend stoutly against an on-fire Fitzpatrick, who fired a six-under-par 64 for a four-round total of 264. “It’s incredible,” said Rai, who was joint leader after the first round and then took the outright lead for good thanks to his bogey-free course-record nine-under 61 on Friday. “Even though it was a big lead going into the final round, you can’t afford to get ahead of yourself with world-class players in Tommy [Fleetwood] and Matt, and two even better people. Rai, who has won three times on the Challenge Tour, picked up the winner’s cheque for US$333,330 in the 60th edition of the Hong Kong Open. Fitzpatrick took home US$222,220. Frenchman Victor Perez shot 67 in the final round to claim third place, and US$125,200, as England’s Tommy Fleetwood fell away with a three-over 73 to finish joint 14th. 24-year old Yorkshireman Fitzpatrick, a five-time winner on the European Tour, was relentless in his chase of Rai, who fought back at key moments with birdies that kept his nose in front. The key moment was on the 17th when Fitzpatrick missed a four foot par putt to fall two behind Rai heading to the final hole. “It was great,” said Fitzpatrick. “Obviously disappointing on 17 there, such a simple bogey, but yeah, I gave it a good go. It was always going to be tough to beat him. The last two days, he’s been on song, very solid and not given anything away, which made my life more difficult. On the 18th, Fitzpatrick recovered from a poor drive off the tee into the tree line, chipped to get up and down for par and all Rai had to do was par or bogey from about 35 feet to lift the title. He fell short of a par but easily tapped in for bogey. The Englishman, who practices meditation to keep calm, didn’t raise his arms in victory nor scream in delight but simply sighed and looked at the gallery. That gesture was typical of his demeanour on and off the course all week, with Rai saying his goals were to “develop as a golfer and develop as a person”. Rai said he didn’t think about victory until the final putt fell, even after Fitzpatrick’s lipped-out par attempt on the 17th. “Matt played incredible all day,” said Rai. “He had been putting so well and you don’t want to see that. It did give me a cushion down 18, which is nice and it’s good to have as many shots as possible. When asked about the conditions, Rai said he had few problems adjusting. US Masters champion Patrick Reed closed with a one-under 69 to finish on 278 and joint 45th place. Spain’s Sergio Garcia parred the final round to finish joint sixth on 271. With victory, Rai goes to the top of the 2019 Race to Dubai rankings with 460 points. His previous best result was a tied fifth at the 2018 BMW International. Andrew Wood is a sporting enthusiast and sport player in Hong Kong.